If you are looking for a one-stop solution for all your printing and scanning needs at your office then you should definitely check out Epson L360 Ink Tank Printer (Print, Scan, Copy). It is nothing less than the best that you can get for your office. Unique blend of latest technology, high quality and efficient performance will surely give you true worth for your money as you invest in this printer by Epson. Order it from Snapdeal to get the best price and deals offered by none. Inkjet print technique is used by Epson L360 Ink Tank Printer (Print, Scan, Copy). It consists of 180 nozzles for black colours and 59 nozzles for other colours like yellow, cyan, magenta and many more. This printer can print in both bi directions and uni-direction. Maximum resolution that can be set in this printer is 5760 * 1440 dpi and the MID [Min Ink Droplet] quotient volume of the printer is 3 Pl. It can print 33 papers per minute for black and white A4 document while if it is a coloured document then print speed is 15 ppm. This technically efficient printer will take approximately 27 seconds to print max photo draft while default photo draft can be printed in 69 seconds. You can also do double aided printing by manual settings. You will get a flatbed format scanner with CIS sensor in this amazing printer by Epson. Maximum hardware resolution in this multipurpose printer is of 1200 * 600 dpi while maximum scan area is of 21.6 * 29.7 cm. Supersonic scan speed of the scanner makes it the first choice in any office. It will scan a monochrome document of 300 dpi in 2.4 m-sec/line and coloured document in 9.5 m-sec/line. Apart from that it can scan a monochrome document of 600 dpi in 7.2 m-sec/line and coloured document in 14.3 m-sec/line. Epson L360 Ink Tank Printer (Print, Scan, Copy) is just not a printer or scanner but can also be used as a photocopy machine. It can copy monochrome A4 size paper in approximately 5 seconds and coloured A4 drafts in 10 seconds. You can get maximum 20 copies at a time in this 3 in 1 printer by Epson. 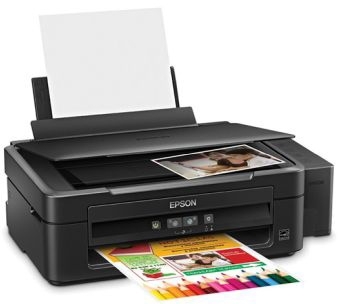 Epson L360 Ink Tank Printer (Print, Scan, Copy) is a highly compatible printer. It can be easily connected to the system using USB 2.0. Epson has brought economical printer which consumes power of around 220-240 V.
You will get 1 year manufacturer’s warranty on purchase of this durable printer by Epson. It will surely be one-time investment which will print papers for long.